It's a bitter sweet feeling when the end of summer is vastly approaching. I welcome the cooler months with open arms but I will miss summer and all her glory. 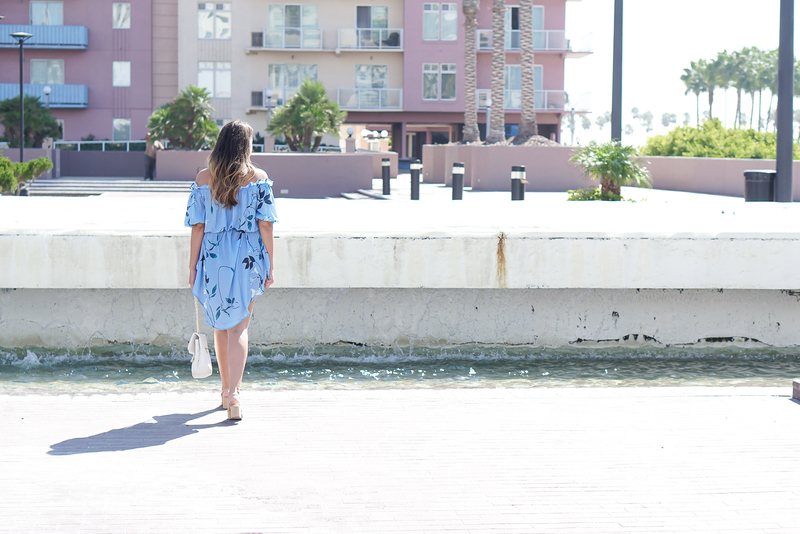 I'm soaking everything up these last few weeks have to offer, including off the shoulder floral dresses like the one I'm wearing today. I will most likely find a way to wear darker colored off the shoulder dresses/tops this fall because I just can't get enough!! As soon as I saw this dress on the SheIn website I knew I had to have it!! The color was so vibrantly blue with touches of green and white. The dress needed very minimal accessories because it truly was the star of the show! I love dresses with beautiful patterns like this, because you can just throw them on and look so put together with very minimal effort. The dress itself looked so beautiful in person but it was a little see threw which is why I wore some black biker shorts underneath. The material is very light and perfect for summer! I was pleasantly shocked that the dress was long enough in the front and even longer in the back for those times you need to bend over and pick something up. The belt is the exact same material as the dress but my only complaint is that the pattern should be on both sides because having the pattern on one side and not on the other makes this dress look a little cheap. Overall I love this dress and for $23 dollars you can't beat the design and cut!! I hope they make this dress in many different colors for next Spring/Summer.